have a (bad) headache (ひどく)頭痛がする. 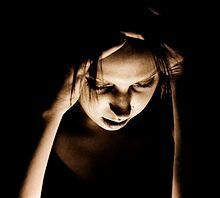 suffer from headaches 頭痛に悩む, よく頭痛がする. From Middle English hevedeche, from 古期英語 hēafodeċe (“pain in the head, headache”), equivalent to head +‎ ache. A pain or ache in the head. (figurative) A nuisance or unpleasant problem. The clumsy filing system has been a huge headache.